That's Lincoln's Tomb in the distance. 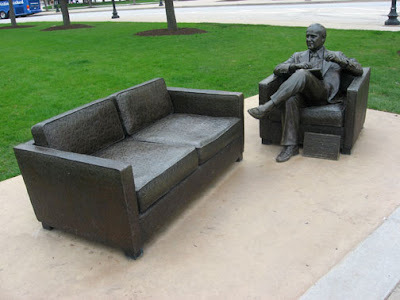 You can't help but think that Lincoln would have been amused. 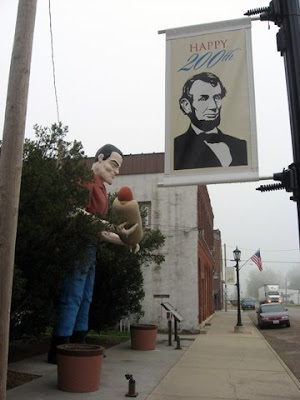 Seems like every town in Illinois, Kentucky and Indiana has an Abraham Lincoln claim-to-fame, but nowhere is more Lincoln-centric than Springfield, Illinois. 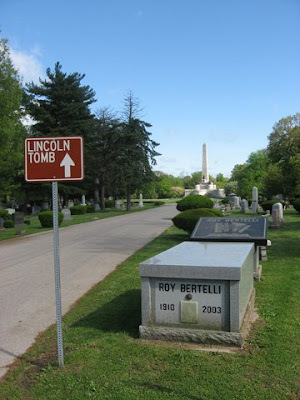 The city's pretty Oak Ridge Cemetery is where Lincoln's vast tomb is located... a hallowed, sacred place. 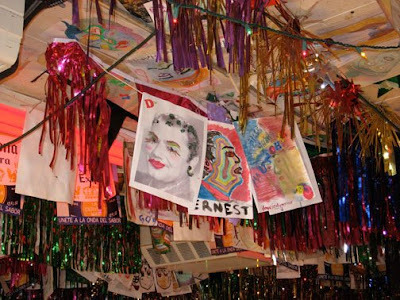 It is also the location of a tomb of a more eccentric nature. 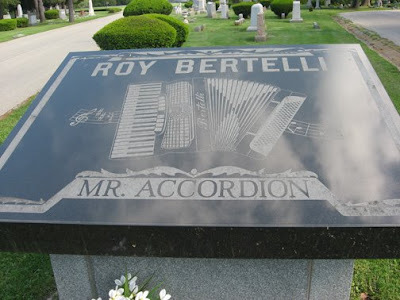 Roy Bertelli, aka "Mr. Accordion," has the primest piece of cemetery real estate, excluding Old Abe's, of course. 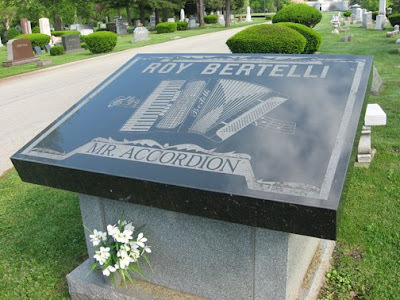 In a triangular plot at the cemetery's entrance sits his tomb with its large crypt and granite tablet depicting an accordion playing a happy tune. There is a back story to all of this reverence, however. 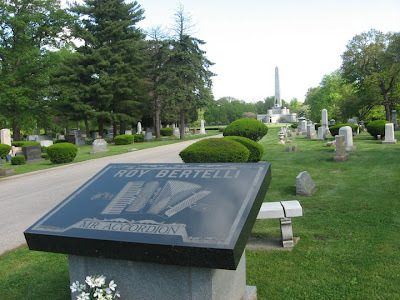 Seems after Mr. Bertelli bought his plot, the cemetery informed him it was sold to him by mistake. They then threatened to take him to court if he did not give it up. This got Mr. Bertelli's Irish up. As a World War veteran he felt disrespected and decided to build his tomb above ground. 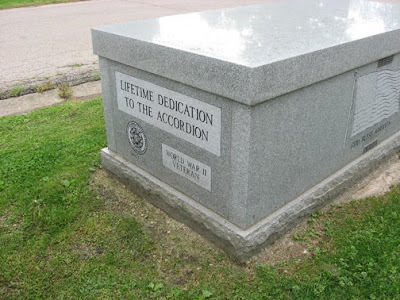 Upon its completion, he would stand on top of it and serenade cemetery visitors with accordion pieces from time to time before descending up to that big Polkabration in the sky in 2003. It's quite a sight to see and adds an unexpected bit of whimsy to a very serious place. Nobody pulls a squeeze play on Mr. Accordion. Nobody. 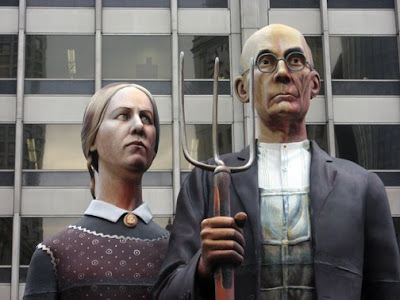 Chicago's 25-foot American Gothic Sculpture: When you come to pitchfork in the road, take it! 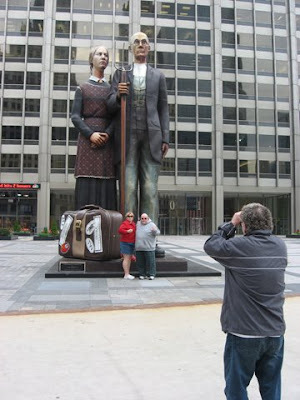 Who doesn't like having their picture taken in front of a 25-foot replica of a Grant Wood painting? 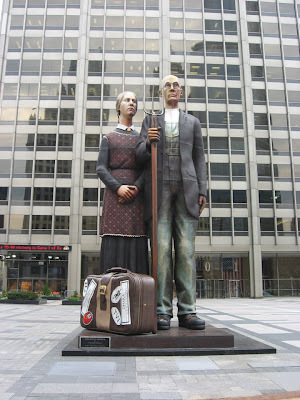 Chicago is a city laden with great outdoor artworks, not the least of which is this 25-foot interpretation of Grant Wood's famous (and often parodied) painting American Gothic by renown sculptor (and Johnson & Johnson heir) J. Seward Johnson. 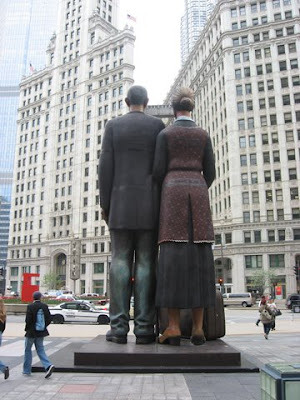 The original painting resides just down the road at the outstanding Chicago Institute of Art, so who better to host this eccentric eye-catcher, which rests along the city's Magnificent Mile at 401 Michigan Avenue. 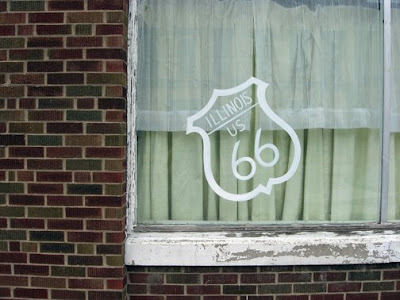 It's awesome in its incongruity: earnest farm folk among gleaming skyscrapers, the Midwest's salt of the earth among the Midwest's most sophisticated urban backdrop, humble farmers blown up to giant urban dwellers. It's also awesome in its execution as a really faithful and really beautiful work of art in its own right. 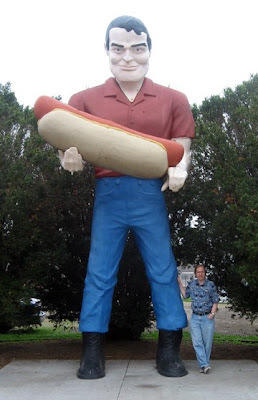 And its just plain fun to walk around, gawk at, and have your picture taken in front of, as any really big thing ought to be. 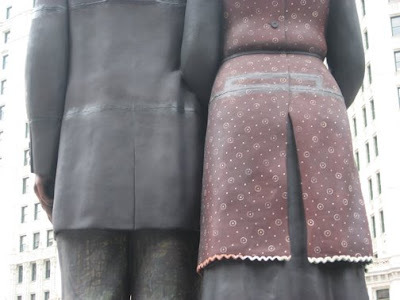 I'm not quite sure what the suitcase signifies... perhaps the sculptor is imagining the farmers are visiting the city for the weekend and are looking for their hotel. In any event, you can't miss it, nor should you. It's pitchfork perfect. 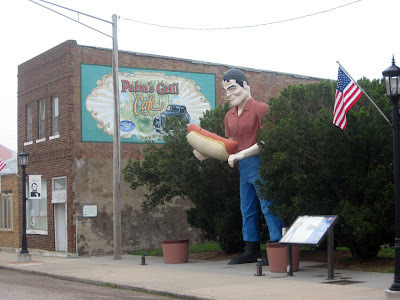 Before we leave the pleasant burg of Atlanta, Illinois, I would be remiss if I didn't mention one of the better unintentional eccentric roadside attractions we've stumbled upon. The town inhabits a free-standing framed door on a lot. No house, no building, just a door. While photographing the beautiful hand-painted building murals in town (see previous post), I did a double-take at this odd sight. 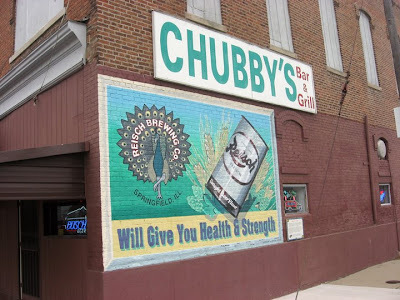 It sits on Route 25 near the intersection of SW 1st Street, across the street from Chubby's Bar & Grill. As we were investigating, a nice chap from Chubby's told us the story. Apparently, several years ago, there was a fellow who wanted to build a house on this plot of land. His wished to build the house with its side facing the street. 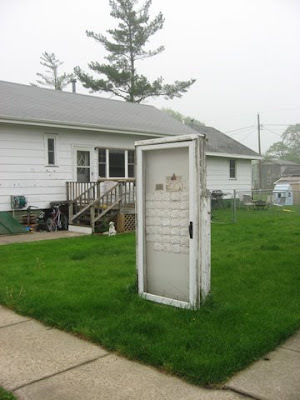 The town informed him of an ordinance that stated a house must have a door facing the street of its address. 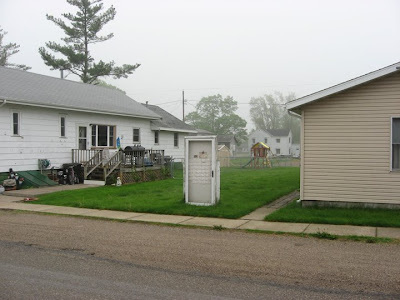 So this fellow built his house the way he wanted to and built a free-standing door facing the street. And there it remains. What makes it even funnier is the fact that the door has a screen/storm door attached. Who says you can't fight City Hall? 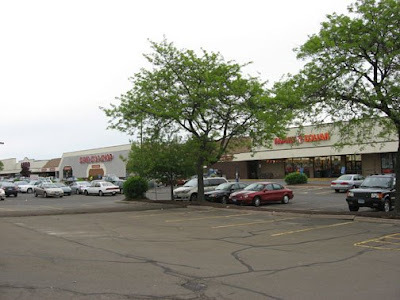 Ernie's Hamden park is in the Stop & Shop parking lot. 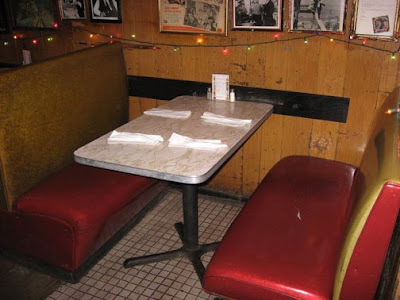 I grew up in the town of Hamden, Connecticut, a suburb to the north of New Haven. 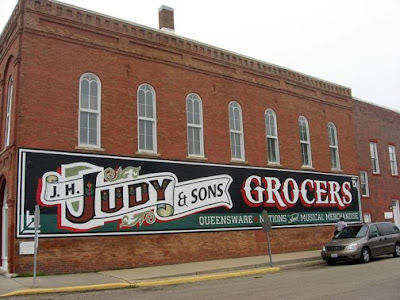 It was a nice place to be a kid and has a lot going for it as a town. A few famous people are from Hamden, including Eli Whitney, inventor of the cotton gin, and Thornton Wilder, author of Our Town. And Dwayne "The Rock" Johnson went to elementary and junior high school in Hamden. 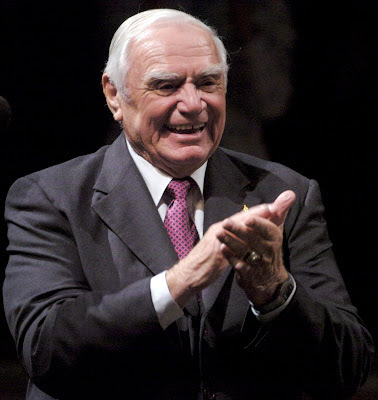 But I'd like to focus on my favorite Hamden native, Oscar-winning actor Ernest Borgnine. Ernie, as his friends know him and who isn't a friend of Ernest Borgnine, was born in 1917 and lived in Hamden, North Haven and New Haven, Connecticut before serving in the Navy for 10 years and then hitting it big in show biz, first with a supporting role in From Here To Eternity and then starring in Marty, his Academy Award winning performance. He's played hundreds of parts but is perhaps best known as lovable Commander Quentin McHale in TV's McHale's Navy. Ernie never forgot where he came from and makes frequent trips back to his home town. He's 92 but looks and acts like he's in his 60s. 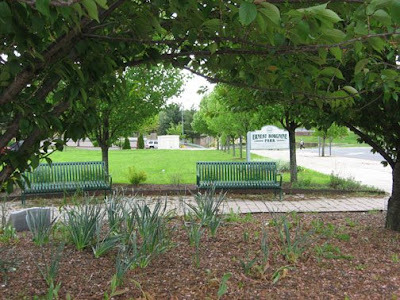 Hamden honored him in 2005 with a small piece of land in the corner of a shopping plaza parking lot. 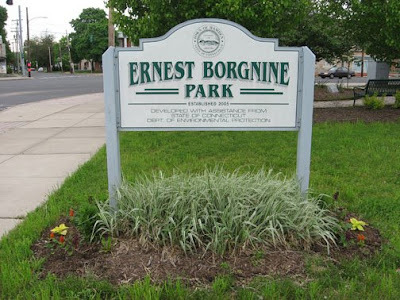 Ernest Borgnine Park sits at the intersection of busy Dixwell and Putnam Avenues, and while it's nice, it would be even nicer if they had a statue or some sort of explanation as to who Ernie is (although, I suppose, if you're Ernest Borgnine, you don't need an introduction). 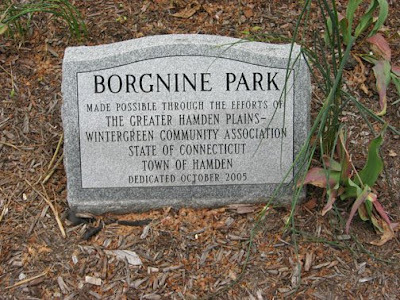 I read that there was a path somewhere in town with a sign calling it Ernest Borgnine Way but it was later replaced with a sign that says "Please clean up after your dog." It's a nice place to get a burrito, too. 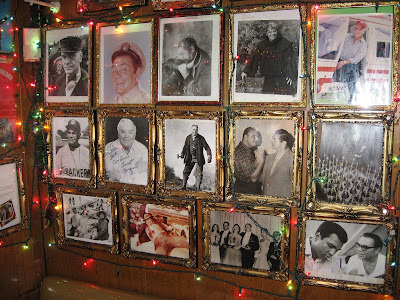 Also, check out the Tortilla Flats website: http://www.tortillaflatsnyc.com/index_home.html and always remember the importance of being Ernest. 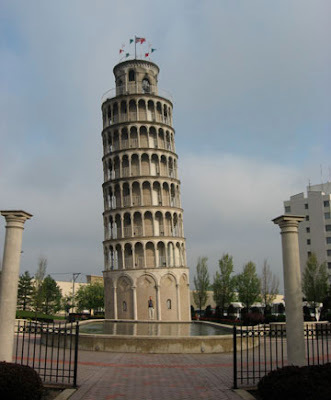 The Leaning Tower of Niles, Illinois: Mamma Mia! 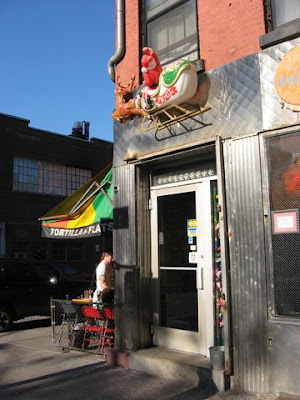 You can grab a hot dog from Papa Chris's across the street and make a day of it. 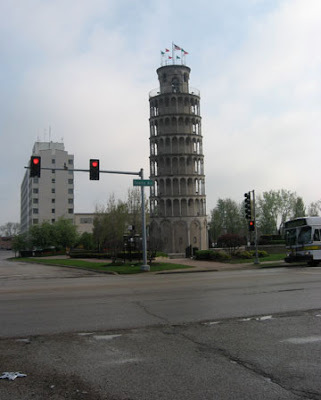 Niles, Illinois is a suburb of Chicago close to O'Hare airport with a terrific eccentric roadside attraction: a half-size replica of the Leaning Tower of Pisa in front of a YMCA. 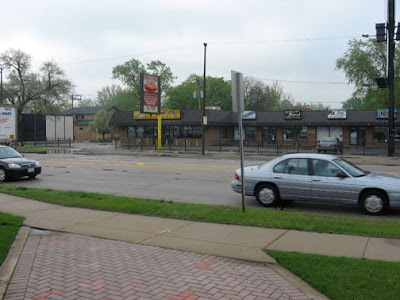 As you tool past motels, light industries and old strip malls on West Toughy Avenue, it appears like a beacon and it's surprisingly large and not tacky. Incongruous, maybe, but not tacky. In fact, it's quite beautiful. 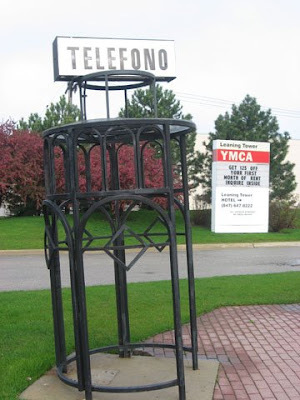 It was built in 1934 by industrialist Robert Ilg as part of a recreation park for employees of the Ilg Hot Air Electric Ventilating Company of Chicago. 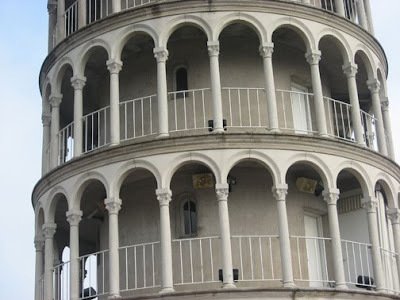 It was also is an elaborately decorative water storage tower for outdoor recreational swimming pools. 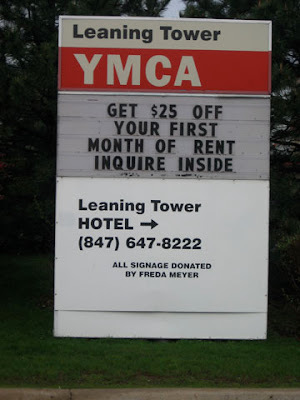 In the early 1960s Ilg's family donated the land so the YMCA could be built and in 1991, the city of Niles established sister-city status with Pisa and spiffed up the place with fountains and nicer landscaping. I hope to make it to Pisa some day, but until I do I've got the next best thing to hold me over. Bravo, Niles! Bello! 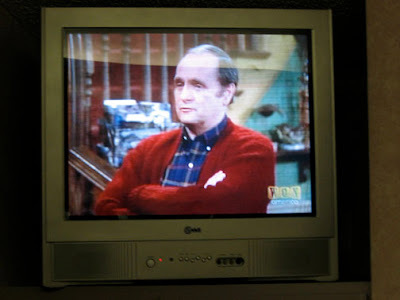 We were able to catch Bob on our motel TV a couple of nights later, although it was Newhart and not The Bob Newhart Show. 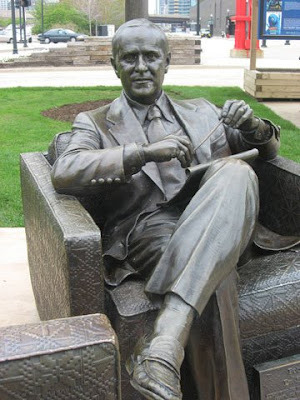 When it comes to comics, Bob Newhart is one of the all-time greats. His wit is razor-sharp and arid-dry but it is delivered by an everyman who looks like your next-door neighbor or your Uncle Bill at the Thanksgiving dinner table. One of my favorite quotes of his is "I don't like country music, but I don't mean to denigrate those who do. And for the people who like country music, denigrate means 'put down'." 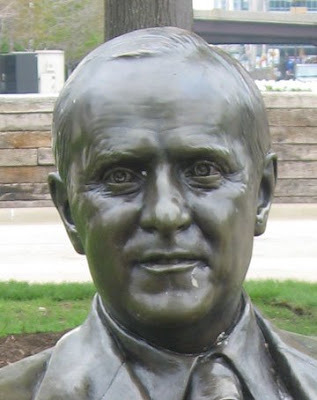 Kanye West was recently quoted saying he thinks it's ridiculous that Bob Newhart has more Grammys than he has. Maybe Kanye has been under Grammy-appreciated, but Bob did deserve the three Grammys he won, including Album of the Year(!) in 1961 for The Button-Down Mind of Bob Newhart. He also starred in two classic TV sitcoms: The Bob Newhart Show (the psychiatrist/Suzanne Pleshette one) and Newhart (the Vermont/Larry, Darryl and his other brother Darryl one). 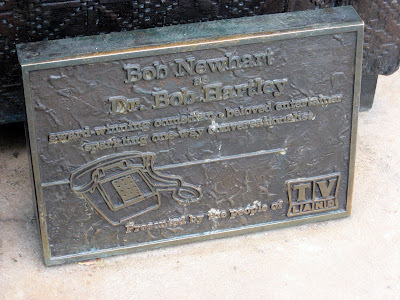 The TV Land network saw fit to pay tribute to him with a statue in his native Chicago, also the location of The Bob Newhart Show. 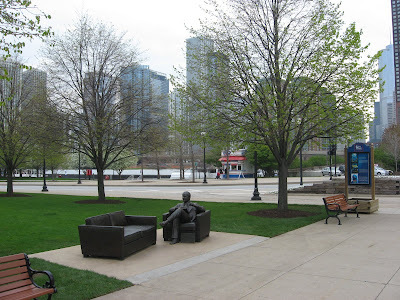 Dr. Bob Hartley is depicted in a lovely park in front of the Navy Pier section of town with a nice view of the spectacular Chicago skyline behind him. 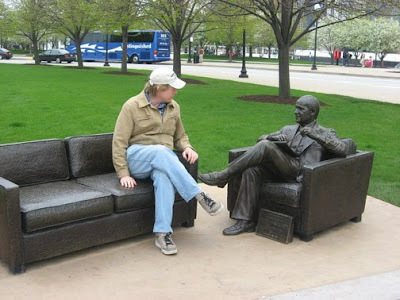 If you like, you can even pretend to be Mr. Carlin on the empty 1970s-patterned sofa next to Bob (although either Bob is slightly smaller than life-size or I've gotten huge). So here's to you, Bob. 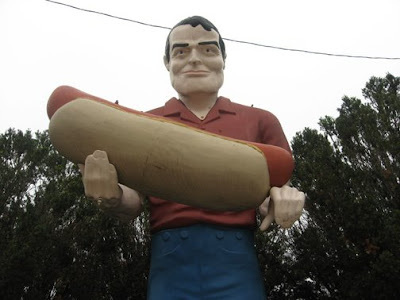 Nobody deserves a statue more.